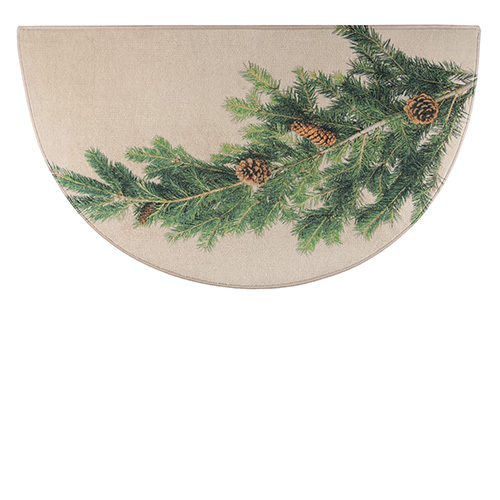 This gorgeous hearth rug is from Goods of the Woods, and features a lovely, distinctive Pine print that includes pine cones on a delicate tree limb. The Goods of the Woods Hearthside Printed Nylon Half Round Rug, Model No. 10884P has been engineered to meet CPSC standards for flammability of carpets, meaning that this rug is safe to use on the fireplace hearth. Flying embers from the fireplace will not ignite the rug, and it will also be easy to clean with a damp cloth. This gorgeous winter rug measures 27 inches wide by 48 inches long, and is the perfect size for creating a focal point out of your fireplace. Can this rug be used outside? This rug is for indoor use only. The rug's colors and pattern were exactly as described and the shipping was FAST, I got the rug a week before I expected to see it.